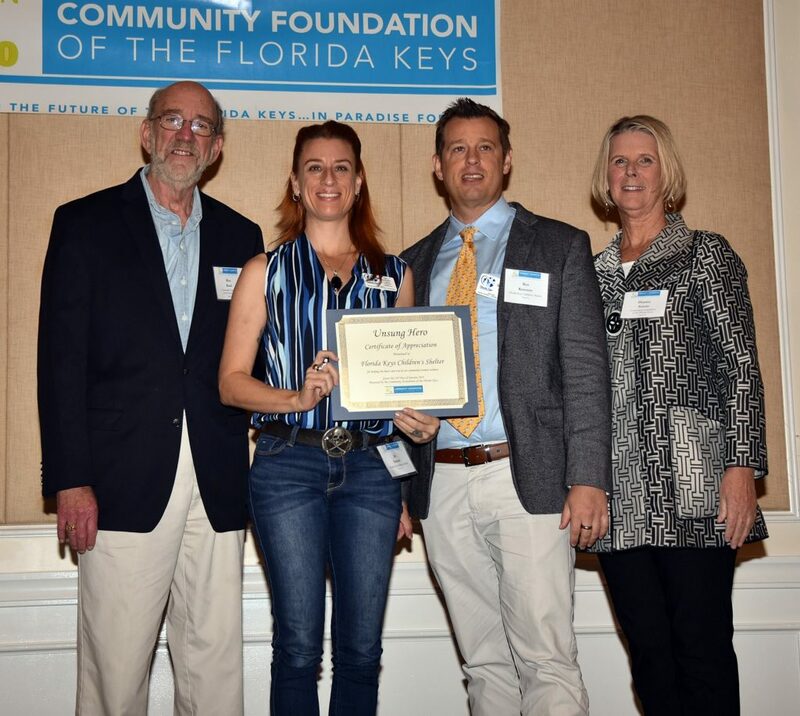 The Florida Keys Children’s Shelter is proud to have been honored by the Community Foundation of the Florida Keys (CFFK) for its outreach to help local residents before, during, and immediately following Hurricane Irma. The Community Foundation presented an award to Children’s Shelter representatives Ben Kemmer and Jai Somers on Friday, January 26th, at a special luncheon at the Key West Marriott Beachside. It was an honor for the Florida Keys Children’s Shelter to join in the event with leaders and board members from other community nonprofits who are making this place we call Paradise so special. 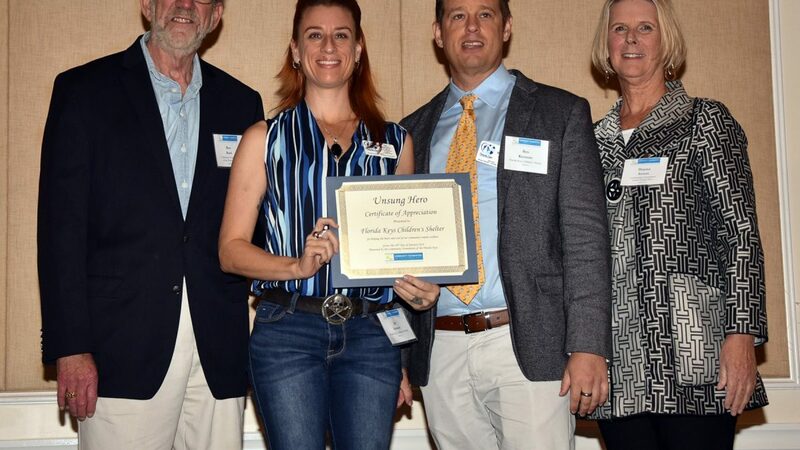 Pictured left to right are Ron Burd representing the CFFK board; Jai Somers from the Children’s Shelter, manager of the Project Lighthouse youth outreach program in Key West; Children’s Shelter co-CEO Ben Kemmer; and CFFK CEO Dianna Sutton. Ron Burd, CFFK Chair said, “We’re grateful for the incredible generosity of so many people in the Keys and around the country who have joined us in this effort.” In all, hundreds of nonprofits and thousands of tireless volunteers rallied in the wake of Hurricane Irma to provide immediate relief and recovery to get our residents’ lives back in order and help our community recover and heal. CFFK worked closely with its nonprofit partners who committed endless resources and toiled nonstop to help those most in need up and down the Keys. The nonprofits are often our community’s true Unsung Heroes. For 18 years, CFFK has been hosting the Unsung Heroes event to honor individual volunteers who give of their time, talents and hard work every day to make the Florida Keys better now and for the future. This year, CFFK is honored to recognize the nonprofits themselves for their passion and diligent efforts that change lives. Through its Project Lighthouse program, the Florida Keys Children’s Shelter distributed urgently-needed supplies like food and toiletries distributed to individuals in Key West in the days following Hurricane Irma. Typically Project Lighthouse only serves homeless youth (ages 21 and under), but following the hurricane the drop-in center did not turn away any individuals in need, giving supplies to children, teens and adults. Project Lighthouse staff provided ready-made meals, and assisted people with filling out FEMA applications. In all, Project Lighthouse served over 300 unique individuals in this three week period, including 170 children from ages 0-18 and 155 adults and families. One success story is a woman who had been a Project Lighthouse client and safely evacuated to the mainland. She and her newborn baby were approved for a FEMA hotel upon their return but needed supplies. They came to Project Lighthouse for supplies for both the mother and baby. Since then she has been able to get a job and is no longer homeless. Before the hurricane hit the Florida Keys, Project Lighthouse staff assisted its clients in securing safe transportation to evacuate to the mainland. Many members of the Florida Keys Children’s Shelter staff evacuated to Orlando to care for the youth living in the Tavernier residential facility and the Key West group homes. Two babies were among the evacuees. The Florida Keys Children’s Shelter counselors across the entire county continue to work directly with families affected by Hurricane Irma. For 30 years, we have been providing a safe place for children and teens. Our no-cost residential facilities are open 24 hours a day, 365 days a year. and we have provided housing, food and counseling to children from Key Largo to Key West as their families rebuild after Irma.